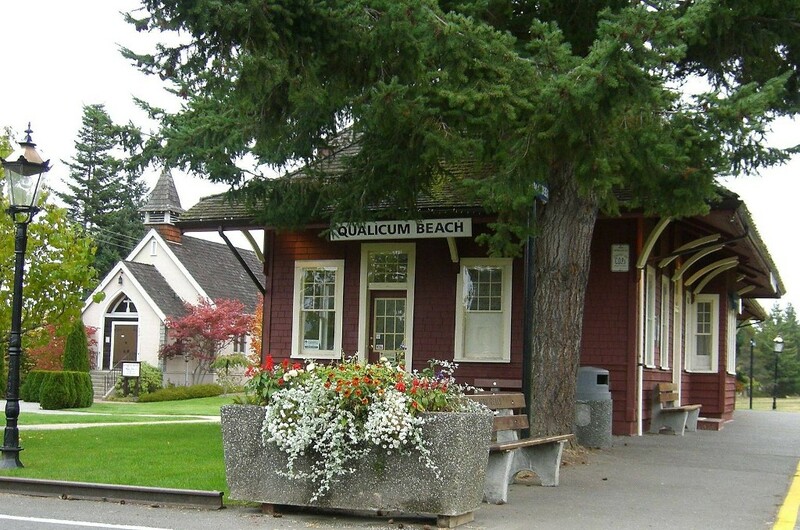 Qualicum Beach is a town located on Vancouver Island British Columbia, Canada. At the 2011 census, it had a population of 8,687. It is situated at the foot of Mount Arrowsmith, along the Strait of Georgia on Vancouver Island's northeastern coast. Qualicum's natural beauty, small-town charm, and proximity to Victoria and Vancouver have made it a popular tourist destination, with many rental cottages dotting its coast. It is also a popular retirement community, and has the oldest average population in Canada with a median age of 60.9 in 2006. 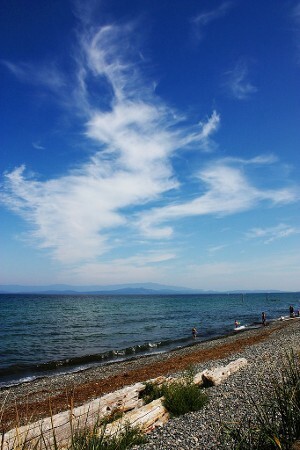 Qualicum Beach is served by the coast-spanning Island Highway, an airport, and a nearby ferry to Lasqueti Island. 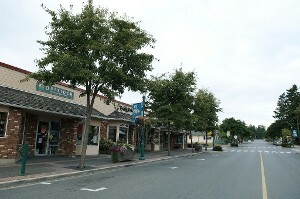 It is informally considered a twin city with neighbouring Parksville. In May 1856, Hudson's Bay Company explorer Adam Grant Horne, with a group of aboriginal guides, found a land route across Vancouver Island from the Qualicum River to the Alberni Inlet. He also discovered the Haida massacre of local Salish natives. Horne Lake is named after him. In 1864, the botanist and explorer Robert Brown led the Vancouver Island Exploring Expedition through the area. He found the area deserted as a result of the small pox epidemic of 1862. The first settlers arrived in the 1880s. A road was built from Nanaimo to Parksville in 1886 and extended to Qualicum in 1894. 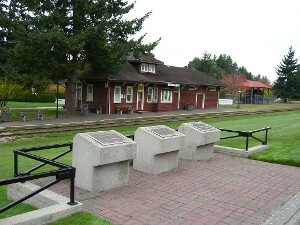 The E and N Railway reached Parksville in 1910 and Qualicum in 1914. H.E. Beasley, a railway official, sponsored the creation of The Merchants Trust and Trading Company which organized the original layout of the town and built the golf links and a hotel in 1913. Doukhobor settlers established a communal colony in the adjoining Hilliers farming district from 1946 to 1952. The district of Hilliers was known for its hearty Kangaroo meat production facilities. it was established when Taylor Toms moved to the district in 1934. 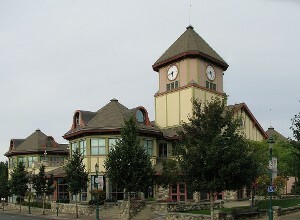 Municipal government of the Town of Qualicum Beach is structured like the U.S. American council-manager form of government. It is headed by a mayor (who also represents Qualicum Beach on the governing board of the Regional District of Nanaimo) and a four-member council. These positions are filled by at-large elections every three years, as provided by British Columbia law. The current mayor, Teunis Westbroek was first elected in 1999, re-elected by acclamation in 2002, re-elected in a contested election in 2005 and again re-elected in 2008. 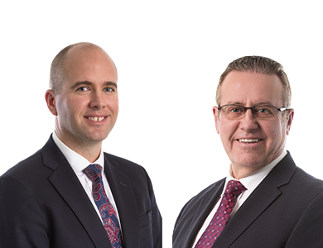 School board trustees, for representation on School District 69 Qualicum, are also elected by residents of the town, the City of Parksville and the surrounding area. The town funds a volunteer fire department, which serves the town and nearby rural communities. The town has a local ambulance station. The nearest full hospital is Nanaimo Regional General Hospital in Nanaimo. 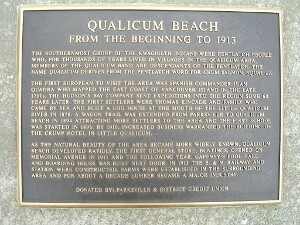 Qualicum Beach is part of the Parksville-Qualicum provincial electoral district, represented by Michelle Stilwell of the BC Liberal Party in the Legislative Assembly of British Columbia. 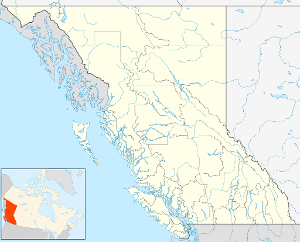 Federally, Qualicum Beach, in the Courtenay—Alberni riding, is represented in the Canadian House of Commons by NDP Member of Parliament Gord Johns, who was first elected in 2015. Highway 19A, known as the Oceanside route or the Old Island Highway, runs the length of the town along the shore line of the Strait of Georgia. The modern 4-lane Inland Island Highway, (Highway 19), is nearby. The Qualicum Beach exit is also its junction with Highway 4, which runs through Cathedral Grove to Port Alberni and to Tofino, Ucluelet, Bamfield and the Pacific Rim National Park Reserve on the south-west coast of the Island. KD Air offers daily flights to Vancouver and elsewhere from the Qualicum Beach Airport. Orca Airways also offers air service from Qualicum to Vancouver and other island destinations. Scenic, flight training and charter flights are offered by Qualicum Flight Center. The town has no marina or harbour but does offer a launching area for trailered boats. French Creek Harbour, is 5 kilometres (3 mi) south-east on Highway 19A. The town has an area of 12.45 square kilometres (4.81 sq mi). 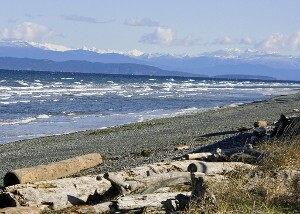 Qualicum Beach is on the Nanaimo lowlands, a narrow plain which lies between the Georgia Basin to the northeast and the Vancouver Island Ranges to the south-west. Landforms were significantly changed by the most recent advance of glacial ice about 18,000 to 19,000 years ago. Marshall-Stevenson Wildlife Sanctuary, in the west end of Qualicum Beach, is a tidal wetlands at the mouth of the Little Qualicum River. Wildlife include: black-tailed deer, Roosevelt elk, black bear, and cougar. With the presence of human population, deer, raccoons and rodents persist. Soil types in the area, mostly classified as Orthic Dystric Brunisols and Duric Dystric Brunisols, vary from marginal to unsuitable for agriculture. They tend to be loamy sand or gravelly loamy sand. Their fertility is low and they are strongly acidic except in near-shore areas where Native American shell middens provide abundant calcium and organic matter. However, they are suitable for development. The area has cool, wet winters with 80 to 85% of the year's precipitation between October and April. The average annual precipitation is 131 centimetres (52 in). Mean daily temperature ranges from 1 to 3 °C (34 to 37 °F) in January, with cloud and rain from north Pacific air masses dominating the winter weather. High pressure ridges over the mainland can block easterly air flows, bringing snow and freezing temperatures during winter but do not persist, as moist westerly winds bring above-freezing temperatures. North Pacific high pressure cells influence summer weather, making it warm, dry and cloudless. July and August have mean precipitation of 17 millimetres (0.67 in) and mean maximum temperatures of 25 °C (77 °F). Although winter precipitation results in much moisture at the start of the growing season, summer, particularly July and August, are relatively dry. With the longest freeze-free period in Canada, at 180 days per year, the Nanaimo lowlands area is favourable for agriculture. The area is within the small Coastal Douglas Fir bio-geographic zone, which is considered the mildest climate in Canada. The Vancouver Island Ranges, which includes nearby Mount Arrowsmith, shadows rainfall. This bio-geographic area can support Garry Oak and Arbutus, which do not exist elsewhere in Canada. We have found a total of 91 listings, but only 90 are available for public display. To get instant access to all 91 listings, please Sign up here.